Many IT and networking professionals, that loved DrayTek’s 2925 and 2926 uncompared feature set, want to deploy them in bigger/enterprise networks but are afraid of not having enough “oomph” for that. Not-so-small SMBs and enterprises all have a wiring closet with properly wired and power protected 19-inch racks in which all equipment must be mounted. Metal case, rack mountable and internal power conditioner are some must haves to get into enterprises without being perceived as low-end non-enterprise equipment. In response to this market need, DrayTek has launched a new router family, the Vigor2952. The Vigor 2952 family is basically the MultiWAN 2925 or 2926 with more “oomph”. More powerful CPU, memory, throughput but basically same familiar features and GUI. All members of the 2952 family come with a combo WAN (GBE / Fiber SFP). If needed, a Fiber WAN can be directly connected to the 2952. Since it uses standard SFP ports, most fiber types can be supported including multimode and monomode with LC connectors. 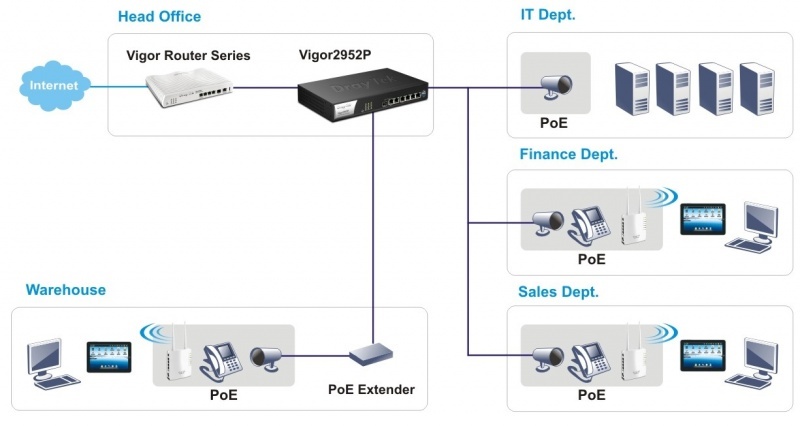 The Vigor 2952P, one model of the 2952 family, have its LAN Gigabit ethernet ports equipped with POE+ supporting both ieee 802.3af and 802.3at POE standards with 60 Watts of power budget. This is a particularly interesting feature that could simplify the equipment needed for most sites that only need one or two external WiFi access points, IP cameras or IP phones. PoE devices can be turned on/off on demand from the router GUI or ACS cloud management server, or make them work on schedule. The 2952P can also be configure to periodically check the connected PoE device, when the device becomes unresponsive the switch can reboot the device by cutting/restoring power. This system self healing feature is called PD Device Check. Many installers find it very useful and saves truck rolls as it is not uncommon to have IP cameras and APs crash and stop working until a power cycle is applied. DrayTek's V2952 is an ideal router for any Managed Router scenario and is supported by both IPTechView-RMM and DrayTek ACS2. IPTechView is a multi-vendor remote management and monitoring (RMM) tool for Managed Service Providers (MSPs) and is compatible with ACS2, as well as links through any DrayTek device on ACS2. The latter being DrayTek's own cloud-based Auto Configuration Server for remote management, bulk setting changes of multi-router networks, firmware (FW) updates and more.